There is very little that New Yorkers on a subway train in the middle of the day are fazed by. That includes a talented singer singing at the top of her lungs. 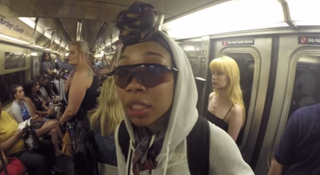 R&B singer, and now Broadway actress, Brandy Norwood took a subway ride in disguise and sang her heart out, but no one paid her any attention. The actress wrote about the account on her personal blog. "Recently, Frank Silent and I took a little subway ride after I'd left the gym," she wrote in a blog post Monday. "Frank, his camera, and I always equal a good time. I decided to hit the subway and sing my little heart out. You've [sic] fun-filled morning left me asking: Can a Sistah get ONE fan?!" As Brandy belted out “Home," practically no one paid her any attention. "What y'all thought of that?" she asked. "Y'all think that was cool?" When no one answered, she said, "Hello?" but still got no response. "Nobody heard me singing? Nobody cares? OK," she said. Apparently not. New Yorkers don’t care about subway singers. But after she got emotional, one guy offered her some supportive words. "Don't be scared. You got talent man, go for it," he encouraged her. "We've seen this a million times. You've gotta do something different." Man, New Yorkers are hard. Brandy, who moved to New York to appear as Roxie Hart in Chicago: The Musical on Broadway, didn’t let the lack of attention ruin her perception of New York City. "I've hung out in Central Park, Times Square, ridden the bus, and I've gotten accustomed to taking the subway, too," she continued. "I feel like a real New Yorker. I'm learning the streets and everything, y'all!"